The contretemps between Uber and Taxi drivers over the UberPop service continue to escalate with Brazil now dragged in. 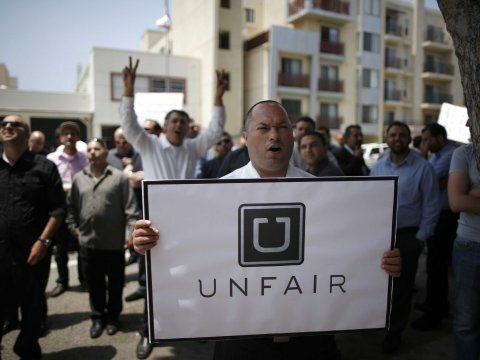 Angry Taxi drivers in Brazil’s main cities of Rio de Janeiro protested aganist Uber blocking major roads and stalling traffic during rush hours claiming that the ride hailing service was bringing unfair competition. This comes just several weeks after similar incidents in France over the same service led to the French government ordering a national clampdown on Uber. In France, the situation also led to the prosecution of two managers of the San Francisco based company for running an illegal operation. The taxi drivers parked their cabs in a 5 kilometers stretch along main highways honking and chanting. In response to the protests in Brazil, Uber offered free rides to customers in what they called a difficult day to get around, according to Reuters. Uber has come under fire in several markets where it operates on claims of unfair competition, claims that their drivers are not well regulated as well as concerns over security issues. In Brazil, law makers have passed legislation to ban the service following stiff competition against taxi drivers. Uber runs several services which include Uber Black, a luxury chauffeur service with Mercedes S-class limousines which costs the same or less than the taxi to ride. Uber Pop (UberX locally), a low cost option in which drivers use their own cars. UberXL but with vehicles of higher standards and charging higher prices. It also has Uber Chopper, a helicopter hailing service, Uber Auto for rickshaws in India and Uber for Boats service. Interestingly, Brazil is home to EasyTaxi, a company offering similar ride hailing services.